Introduction: Intravaginal delivery is currently considered to be an important alternative route for poorly-absorbed, rapidly metabolised oral drugs. Objectives: The objective of this study was to evaluate (i) the preliminary feasibility of using the readyto- use vehicle Pentravan® to compound dienogest, gestrinone, nimesulide and piroxicam and (ii) the vaginal administration of theses formulations to patients with pelvic pain associated with endometriosis (PPRE). Methods: Intravaginal creams were compounded containing the active pharmaceutical ingredients (APIs) individually and with no addition of permeation enhancers (dienogest 0,2%, gestrinone 0,5%, nimesulide 2,0% and piroxicam 2,0%). For quality control, pH, drug content and particle size were determined. HPLC methods were developed and validated for each formulation. 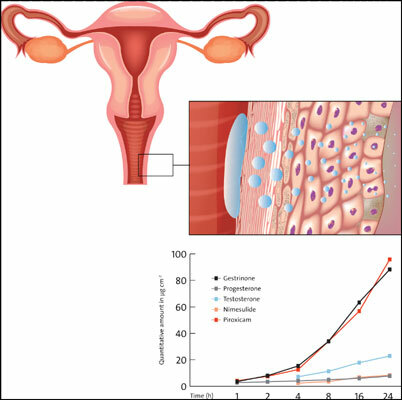 Vaginal permeation profiles were determined using porcine vaginal mucosa on Franz-type diffusion cells and then kinetics parameters were determined. Results: Quality control of the formulations showed that the products were convenient and easily prepared, with narrow size distribution. Diffusion experiments demonstrated fluxes of 15.98 µg.cm-2.h-1 for dienogest, 3.91 µg.cm-2.h-1 for piroxicam, 3.72 µg.cm-2.h-1 for gestrinone and 2.26 µg.cm-2.h-1 for nimesulide. Dienogest and gestrinone had permeation fluxes and quantities of drug absorbed hypothetically compatible with therapeutic effect in vivo (fluxes to attempt in order to deliver the recommended daily doses to treat PPRE were calculated as 0.87 µg.cm-2.h-1 for dienogest, 0.69 µg.cm-2.h-1 for gestrinone, 70.45 µg.cm-2.h-1 for nimesulide and 9.64 µg.cm-2.h-1 for piroxicam), whereas nimesulide and piroxicam studies showed a great amount of these drugs retained in the vaginal mucosa. This could account for a local effect for these two substances. Conclusion: Pentravan®, which already has an established role for transdermal delivery of drugs, seems to be a feasible intravaginal vehicle. Particularly in this study, we highlight its use for vaginal delivery of dienogest and gestrinone for the treatment of PPRE. In vivo studies must now be conducted to confirm these data. Vaginal delivery, permeation kinetics, pentravan, franz-type diffusion cell, dienogest, gestrinone, nimesulide, piroxicam.